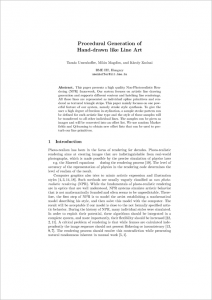 This paper presents a high quality Non-Photorealistic Rendering (NPR) framework. Our system focuses on artistic line drawing generation and supports different contour and hatching line renderings. All these lines are represented as individual spline primitives and rendered as textured triangle strips. This paper mainly focuses on one powerful feature of our system, namely stroke style synthesis. To give the user a high degree of freedom in stylization, a sample stroke pattern can be defined for each artistic line type and the style of these samples will be transferred to all other individual lines. The samples can be given as images and will be converted into an offset list. We use random Markov fields and Q-learning to obtain new offset lists that can be used to perturb our line primitives. If some of the figures don’t show correctly in your browser, please try opening the manuscript in a standalone pdf reader program (e.g., Adobe Reader).